Lower back pain, or lumbago, is a common ailment and can occur anywhere from the bottom of the rib cage to the top of the buttocks. This area of the body bears most of your body weight and can easily become strained or sore by performing simple tasks such as lifting, reaching, twisting, and stretching. Muscular strain is the most common cause of lower back pain. 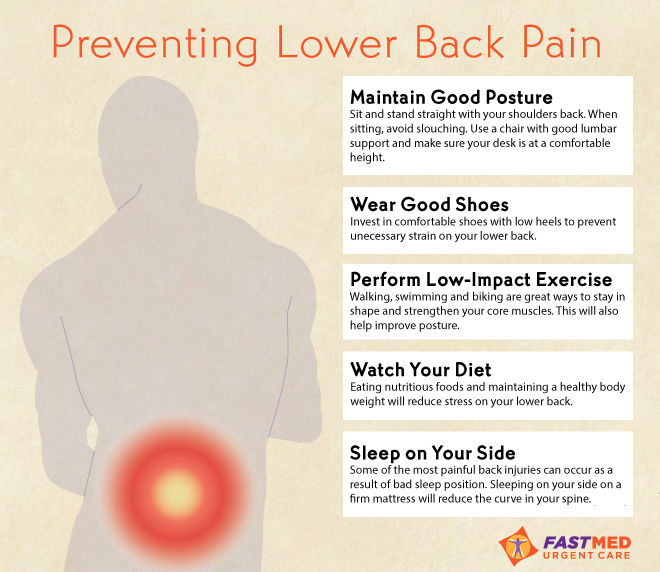 Symptoms of lower back pain can vary greatly from person to person. The pain experienced can be dull, tight, achy, sharp, stabbing, or feel like cramps. It can be localized to a small area of the back or be more generalized. The pain will often be associated with muscle spasms, which are firm, tender “knots” that can be felt in the muscles of the back. These symptoms will sometimes resolve in a few days or can last for weeks. In more severe cases, pain may radiate down into one of both legs and sometimes be accompanied by numbness and tingling. FastMed Urgent Care has skilled physicians, physician assistants, and nurse practitioners who are qualified to diagnose and treat many causes of lower back pain. They can provide medications to help relax muscles and ease pain, and may also offer exercises, stretches, and other treatment options to help speed the recovery process. For patients with long-term or chronic lower back pain, referrals to therapist, orthopedist, or other specialist can be made to ensure the most effective relief possible. If you or someone you know is experiencing lower back pain, stop by any of FastMed’s convenient locations and let our healthcare providers help get you back in action.